C1591. KLAUS TENNSTEDT Cond. 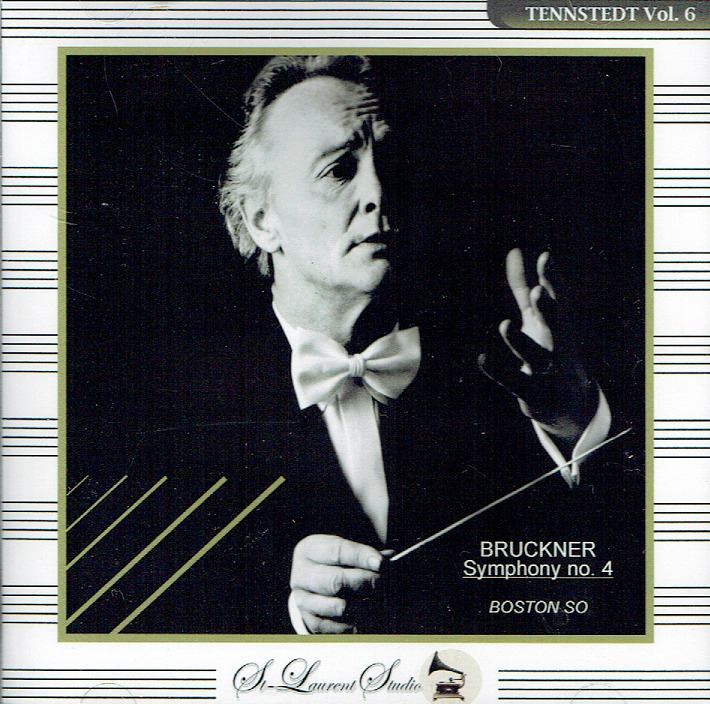 Boston Symphony Orchestra: Symphony #4 in E-flat 'Romantic' (Bruckner), Live Performance, 1982, Symphony Hall, Boston. (Canada) St Laurent Studio YSL T-695. [Another majestic Tennstedt Bruckner experience displaying the splendor of the Symphony Hall acoustic.] Transfers by Yves St Laurent. "Klaus Tennstedt's Bruckner always brings into balance the contrasting elements of grandeur and intimacy. While he never slights the majestic power of the music, he also never forgets how strongly Bruckner's roots stemmed from Schubert. In addition to the music's mystical elements, we are always aware of the music's foundation in Austrian folk dance. It is this balance, produced with passion and heartfelt beauty, that distinguishes Tennstedt's Bruckner performances, and it is what we have here. 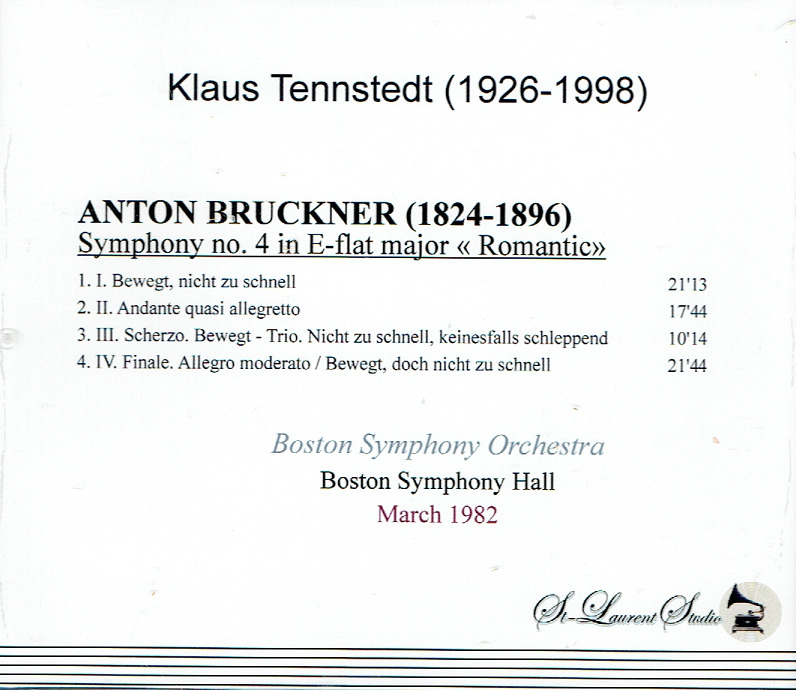 Tennstedt's U.S. debut was made [in 1974], when he led the Boston Symphony in two weeks of subscription concerts. The first was an all-Brahms evening, the second was devoted to Bruckner's Eighth Symphony [C1425]. By the end of those two weeks, he had become an overnight star. 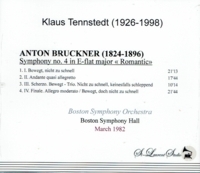 The word flew out of Boston so quickly that Tennstedt was immediately signed by Columbia Artists Management, which instantly began receiving offers for him to guest conduct all the major American orchestras…. The Boston Symphony plays beautifully for him. There are a few slips, as one expects in a live performance, but none is major. One is struck by the sheer beauty of the string playing and the unanimity of the various brass and woodwind choirs. St. Laurent Studio's remastered sound is a very fine representation of the orchestra's broadcast quality. This CD is available at Norbeck, Peters & Ford (norpete.com)." "Because he spent the beginning of his career in East Germany, Klaus Tennstedt was virtually unknown in the West until he was in his late 40s. But his international career took off after he left East Germany in 1971. From the time he made his first appearances in North America, with the Toronto and Boston Symphony orchestras in 1974, he was regarded as an uncommonly probing, expressive conductor of works from the mainstream Romantic repertory. Mr. Tennstedt was born in Merseburg, Germany, on 6 June, 1926. When he was 15, he enrolled at the Leipzig Conservatory, where he studied violin, piano and music theory. He also studied in Dresden during World War II, and he told one interviewer that after the firebombing of Dresden in 1944, he was in the fire brigade and assigned to dig bodies out of the rubble. In 1948 he was appointed concertmaster of the Halle Municipal Theater Orchestra, where his father was a violinist. Four years later he began conducting the orchestra, and he soon became its music director. In 1958, he became music director of the Dresden Opera and in 1962 he took over the Schwerin State Orchestra and the Schwerin State Theater. During the 1960s, Mr. Tennstedt had an active touring schedule in East Germany, and was a frequent guest of the Leipzig Gewandhaus Orchestra, the Dresden Philharmonic, the Dresden Staatskapelle and the Berlin Radio Orchestra. He also performed in the Soviet Union and in Czechoslovakia. When preparing for a tour in 1971, Mr. Tennstedt found that his passport had been mistakenly stamped with an exit visa for the West. He left East Germany for Sweden, announced his intention not to return, and persuaded the East German Government to allow his wife to join him. In Sweden, he became the director of the Stora Theater in Goteborg and the conductor of the Swedish Radio Symphony Orchestra in Stockholm. In 1972, he became director of the Kiel Opera in West Germany. Mr. Tennstedt's first break in North America occurred after the death of Karel Ancerl, the director of the Toronto Symphony Orchestra. When the orchestra's managing director, Walter Homburger, went to Europe in search of a replacement, he read some reviews of Mr. Tennstedt's work in Kiel. After hearing him conduct Bruckner's Seventh Symphony, he hired him for a series of Toronto concerts in May 1974. He made his Boston Symphony debut later that year [C1425]. Mr. Tennstedt became principal guest conductor of the London Philharmonic in 1977, served as principal guest conductor of the Minnesota Orchestra from 1979 to 1982, and returned to the London Philharmonic as its music director from 1983 to 1987. After he relinquished the post, he became the orchestra's conductor laureate."